In the South Pacific, it is not a matter of IF a natural disaster will occur, but WHEN, and how severe it will be. 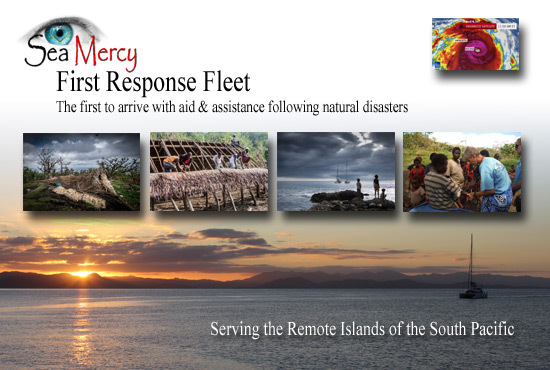 Sea Mercy’s First Response Fleet, based in Port Denarau Marina (Nadi, Fiji), stands ready with food, shelter, desalination equipment, professional medical care teams and supplies. Pre-approved by our island nation partners, our volunteer vessels and crews are ready to assist with emergency aid distribution within days, not months, of a natural disaster. Our First Response Fleet offers a professional, flexible and confidential disaster response program for you to join. Like many yacht owners, your heart and desire is to help when disasters strike. Yet the frustration of paperwork, approval delays, scheduling chaos, and securing emergency aid has prevented many from helping. Our First Response Fleet offers a professional, flexible and confidential disaster response program for you to join. We confidentially handle all the approval paperwork, the purchase and staging of emergency aid supplies, and notifying our member vessels of any upcoming disasters in your area and how you can assist. The impact a trained Superyacht can have following a natural disaster. Emergency Response Teams - At your request, we have dedicated Emergency Response Teams (ERT) standing by to join your crew to lead and assist your crew during your remote island assistance work. These ERT's are trained specifically to assist in all aspects of land and water based disaster relief assistance needs. These areas of expertise include: Security, Medical, Water, Shelter, Recovery and Training programs. Our Emergency Response Teams are trained specifically to assist in all aspects of land and water based disaster relief assistance need. Emergency Training Programs (Vessel & Crew) - With your approval, and prior to your first response assignment, our ERT's will provide your vessel and crew with Level I Emergency Response Training (free of charge). We also have additional Training programs available for your crew. Our goal by providing these training programs is to instill confidence and capacity with your crew during your time with assisting those in need. Immediately following a natural disaster, there are four primary emergency needs that require immediate attention on the remote islands: Water, Food, Shelter and Medical Care. Our First Response Fleet program is designed specifically to meet those needs, while making participation simple and safe for our First Response Fleet before, during and after their assignment. The vast majority of drinking water used on remote islands is generated from roof catchment (gutters) and stored in water tanks. These are often destroyed during a Cyclone. This puts the remote islanders at risk of dehydration and water born illnesses. Our vessels and teams are trained to deliver and install solar desalination units, water filters, storage tanks, water bladders, pipes and connectors. The majority of agricultural crops and naturally growing fruit and coconuts are destroyed following a cyclone leaving the islanders foraging for what little remains until crops can be replanted and grown (3-6 months). To meet this need, we have created what we call Life Units that can be easily dropped off at each remote island stop. Each unit can feed a family or small village for 2-weeks. With homes destroyed or roofs gone, our goal is to provide devastated families with the ability to stay dry and warm until international aid can be delivered. To help the remote islanders get back to healthy conditions and self-sufficiency, we have created Shelter Units that include tarps, hammers, nails, machetes, stoves, pots and pans, fishing line, and hooks. Following natural disasters there are always emergency medical needs that need to be addressed and delivering a trained medical team with the necessary medical supplies is the only answer. We have also created a Medical Unit to leave with the village nurse or medical center. Joining the First Response Fleet is easy and confidential. Simply contact us directly at info@seamercy.org or through your yacht agent. We will add your vessel to our island nation partner agreements, and submit your vessel and crews for pre-approval for future emergency needs. We will keep you, your captain, and/or your agent posted on any pending concerns and/or natural disasters and handle all the heavy lifting and paperwork until there is a need. You are never obligated to send your vessel, and the captain always has the final say on any aspect of an assignment. Based in Port Denarau Marina in Nadi, Fiji, Sea Mercy’s First Response Fleet is a partnership of several key organizations and individuals who have a heart for the people of the South Pacific and are working together to change the way Emergency Aid and Medical Care are delivered to the neglected and forgotten remote islands following natural disasters. Sea Mercy (Fiji) - Our mission is to be the primary advocate and service delivery platform for the thousands of remote islands across the South Pacific. To ensure that the same level of health, education, economic, and disaster relief services and opportunities available on the primary islands, are also available to them. Port Denarau Marina (Nadi, Fiji) - As the South Pacific’s premiere marina facility, Port Denarau Marina is the center of the South Pacific and the perfect disaster relief hub for our First Response Fleet vessels and an emergency aid storing and staging location. YachtAid Global (International) - Dedicated to delivering humanitarian, developmental, and conservation aid on-board yachts to isolated and underprivileged coastal communities worldwide. YachtHelp (Nadi, Fiji) - Formed in 1987, their central focus is to supply professional shore support services to superyachts operating in Fiji and our First Response Fleet. Our Volunteer Vessels - A volunteer fleet of large yacht owners who are committed to helping meet the needs of those devastated by natural disasters by volunteering their vessels, crews and financial support to the First Response Fleet program. To purchase and stage the Water Desalination equipment and various Food/Life, Shelter and Medical Units are a huge expense. We are always looking for "In-Kind" donation partners (call or email us) or those who can help us offset these costs through their financial support (click on the Donate button below).